This article was written by Nicholas Lo, a master student at Yale School of Forestry and Environmental Studies. Nick is completing a research fellowship at GEI over the summer. 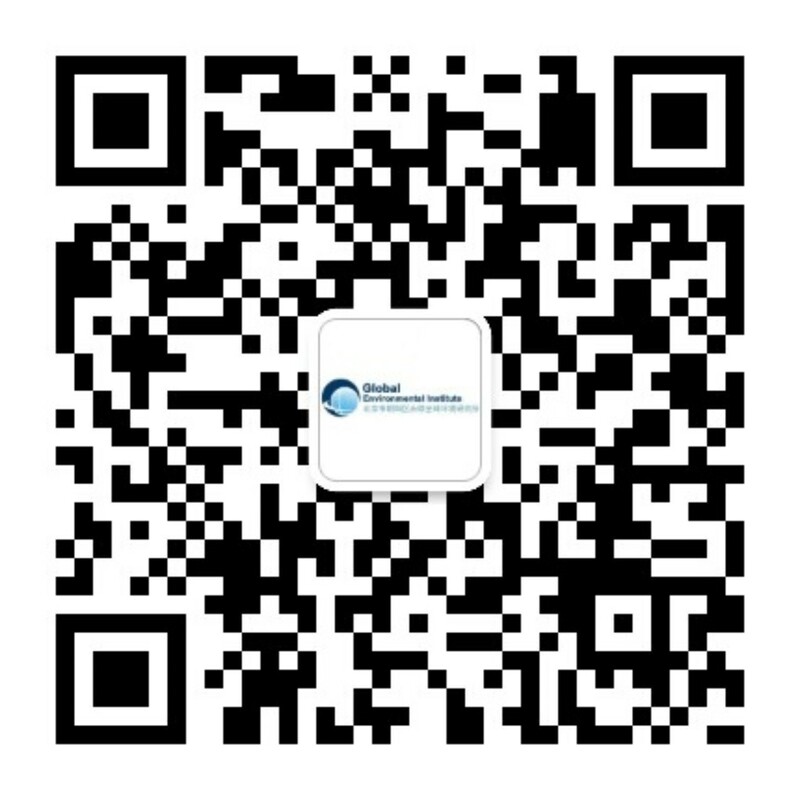 Please note that the thoughts and views expressed in this article do not necessarily reflect that of Global Environmental Institute. Economic analysts have pointed to China’s model of infrastructure-centric investment as a means of stimulating inclusive development across the global South. China’s Belt and Road Initiative presents opportunities to catalyze similar growth in developing countries, but this model presents large risks. 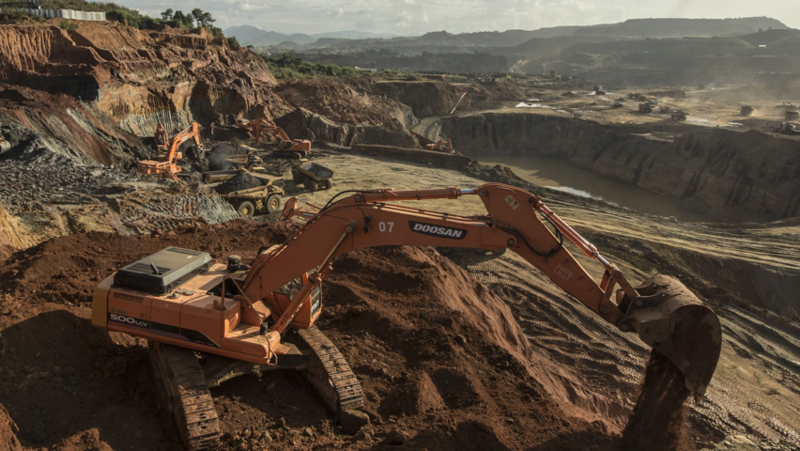 If longstanding issues of governance and rule of law are not addressed, infrastructure development in Southeast Asia may intensify the over-extraction of natural resources and exacerbate inequality. There is no doubt that China’s overseas investments have a major role to play in other countries’ sustainable, inclusive and equitable development. But around the world, ‘business as usual’ – where corrupt government actors work hand-in-hand with unscrupulous companies – has already degraded forests and waters that provide critical ecosystem services like carbon storage, nutrient cycling, and food provision. Without change, that model endangers sustainable development and mutually beneficial outcomes, especially for developing countries. 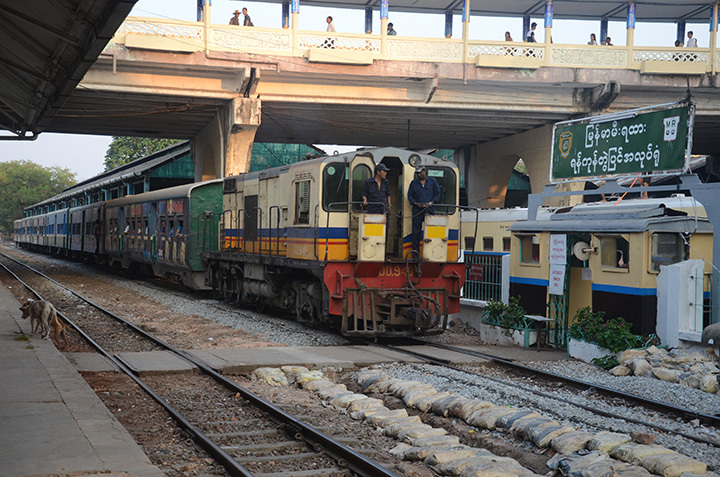 Myanmar is an important case study for the Belt and Road Initiative because it presents an opportunity for the country to ‘leapfrog’ the mistakes of other countries – but the history and politics of the country create many risks. The persistent challenges for Myanmar’s sustainable development include developing natural resources sector while protecting ecosystems and distributing benefits evenly. The challenges posed by timber, oil/gas and mining sectors are briefly outlined below. 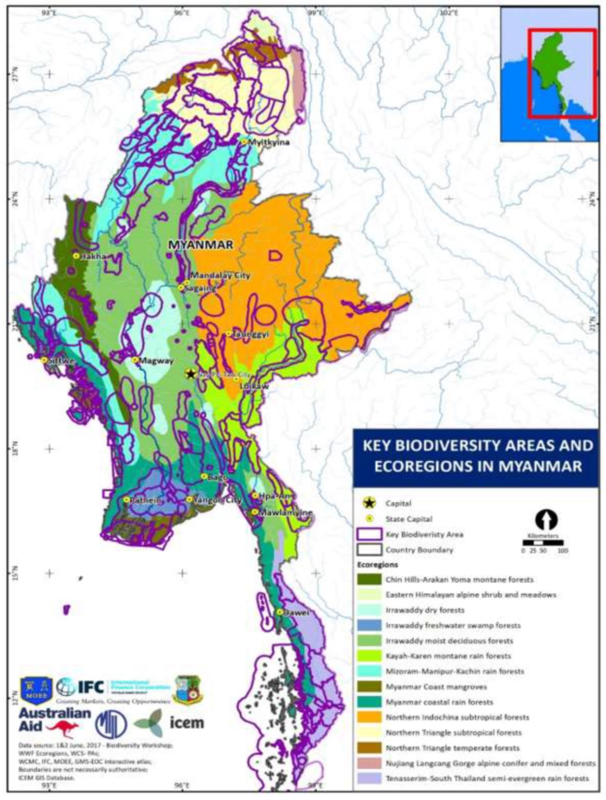 Though Myanmar maintains one of the highest rates of forest cover in the region, from 2002-2014, intact forest cover (defined as >80% of canopy cover) has declined rapidly from 49% to 38% of the total forested area of the country. Although Myanmar Forest Department reforms have stemmed illegal logging somewhat, continued widespread corruption and the presence of willing foreign buyers continues to facilitate deforestation across the country. Intact forest ecosystems in Myanmar, which are essential to mitigating climate change and preserving biodiversity, are also increasingly threatened by large-scale logging, conversion to plantations, and mining. Such extractive businesses force forest-dependent communities, who have historically used sustainable agroforestry systems, to use natural resources more unsustainably just to survive. As foreign investment into the country’s natural resources and land sectors continues to increase, many of Myanmar’s marginalized citizens have not benefited from such investments. Clear examples are provided by the oil and gas sector in Myanmar, which is the largest sector of foreign investment in the country. 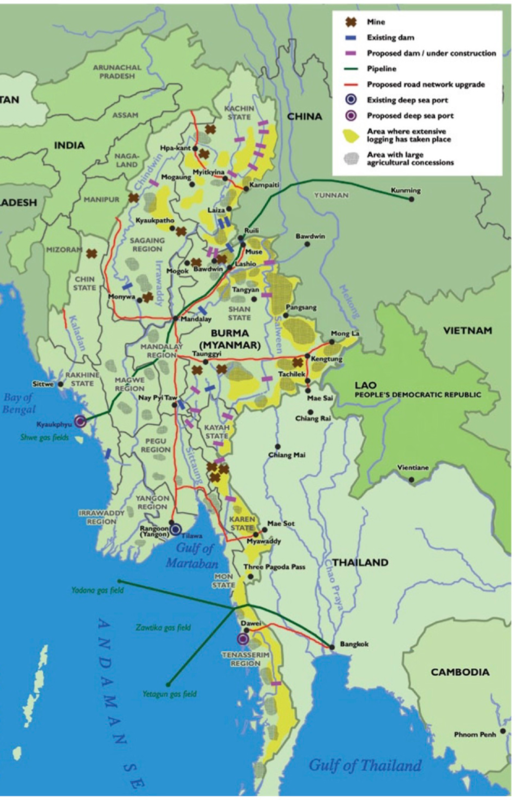 Under the military regime, the Yadana gas pipeline in Tanintharyi Region and the Yetagun gas pipeline that passes through Mon State involved countless abuses against local communities, while projects like the Shwe oil and gas pipelines that transverse Myanmar to China and Myingan gas power plant near Mandalay have been accused of unfair treatment of locals, failing to bolster sustainable job growth. Another aspect of natural resource development is conflict – the ongoing war in northern Myanmar cannot be simply reduced to ‘politics’. 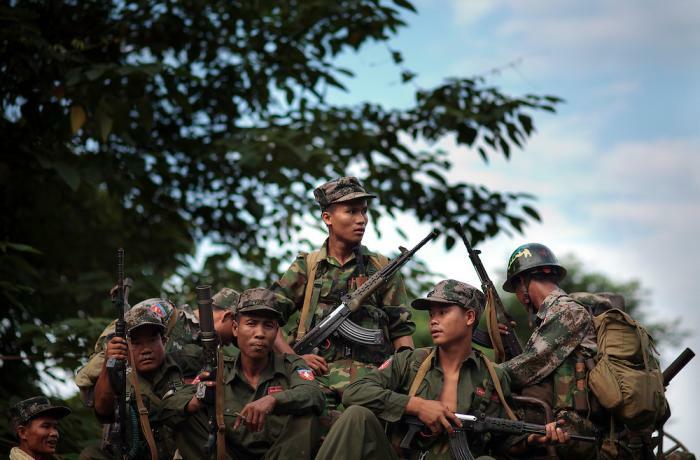 Historically, these conflicts have been about inclusive and equitable development – the ethnic armed groups fight against the military over unequal distribution of benefits from natural resource extraction. An investigative study in Kachin State estimates that jade revenues from the region may be as high as US$31 billion, over half of Myanmar’s GDP in 2014 – much of which was kept in the private hands of military officials, instead of funding development for Kachin communities. The continuing violence is also linked to the lucrative markets in China, where most jade ends up. Foreign investments in resources like oil and gas, timber, hydropower, minerals and land are embroiled in controversies because benefits have accrued to a minority of society, while the majority of people suffer the negative impacts. As can be seen from the cases above, much of the conflicts in Myanmar are related to transparency and benefits sharing – who is getting what, and how much. 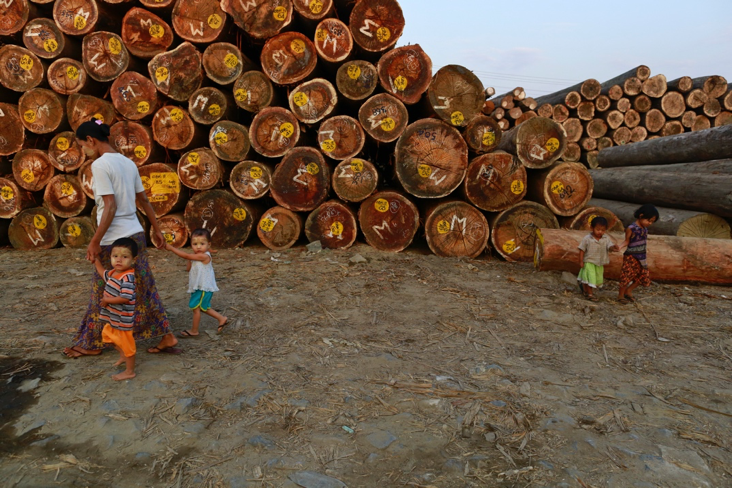 In the complex and volatile political context of Myanmar, corrupt government actors, armed groups, and foreign businesses have benefited from the continued lack of regulation in sectors like timber, agriculture and mining. Clearly, the Myanmar government must improve its legal frameworks and governance capacity to ensure inclusive and equitable development for its diverse population. But at a time where the Myanmar government is looking for international investors, responsible governance must extend to foreign companies as well. A common refrain of companies is that negative impacts of foreign investment are a result of the host country government’s weak governance – which is true, but this doesn’t absolve foreign companies from acting irresponsibly. 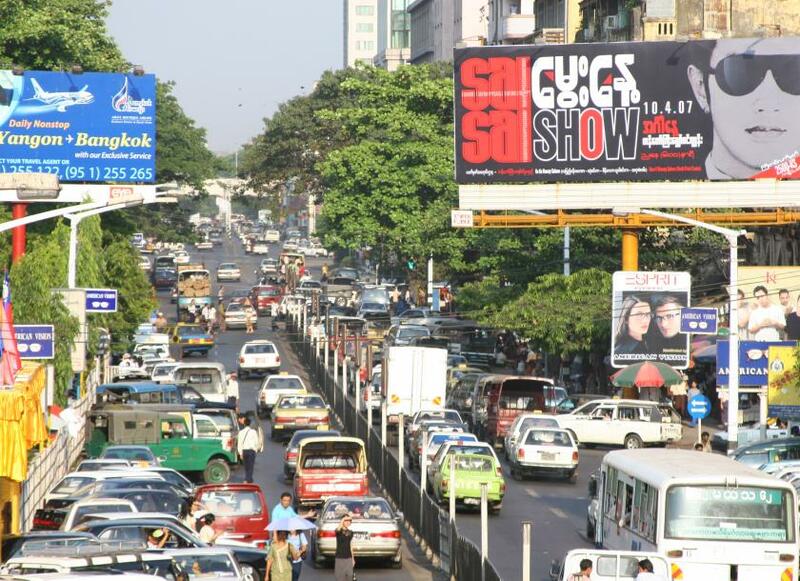 If Chinese investment capital and development finance keep ending up in the hands of local elites that have been in power for decades, it is not surprising that public attitudes in Myanmar would be opposed to Chinese investment projects. When Chinese companies and other stakeholders embark on the Belt and Road route, they must engage transparently and fairly with local partners that they work with, especially the local communities that are affected by projects. Regulatory frameworks in companies’ home countries play an important role as well. The Chinese government has taken steps to release guidelines outlining the ways in which Chinese enterprises should invest responsibly overseas. 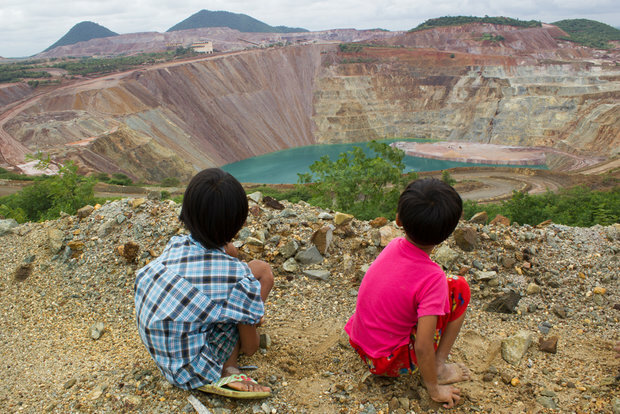 After a series of high-profile controversies like the Myitsone dam and Letpadaung copper mine, and now the Kyaukphyu Special Economic Zone, Chinese companies need to engage with local people’s concerns over environmental and social impacts to restore the Myanmar public’s trust in Chinese investments. No matter what country of origin, companies investing in Myanmar’s natural resources must respect local people’s perspectives and ensure that equitable benefits and environmental protection are priorities – especially for the indigenous and ethnic minority communities that rely heavily on healthy forests and land for their livelihoods. If Chinese companies don’t take steps to improve their business practices, investment projects may end up creating further backlashes against China. 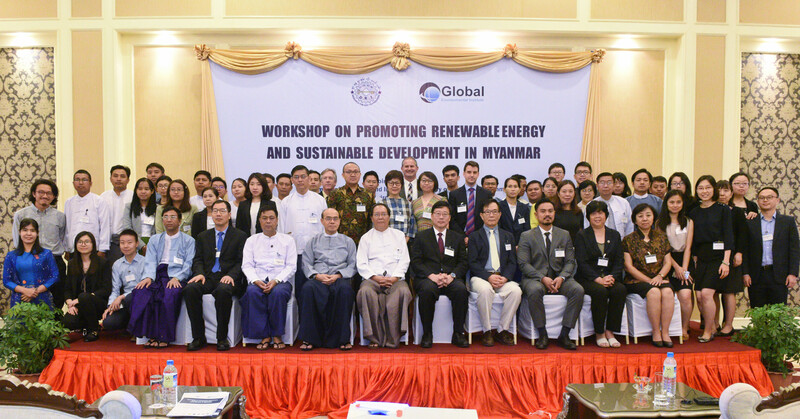 One positive step forward in Myanmar is the recent Strategic Environmental Assessment (SEA) of the hydropower sector prepared by the IFC in conjunction with Myanmar’s Ministry of Natural Resources and Environmental Conservation. The SEA analyzes the basin-wide impacts of hydropower, with the aim of integrating socio-cultural concerns, biodiversity conservation and other dimensions into decision-making about energy infrastructure projects. 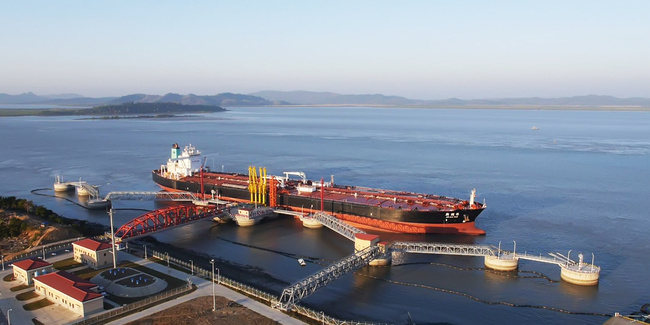 However, the SEA has been criticized for not paying enough attention to the potential for hydropower development to re-ignite conflicts – like during the breakdown of the Kachin Independence Army ceasefire in 2011. What must be recognized by all stakeholders is that operating in a country like Myanmar will involve navigating the complex politics over land and natural resources, as well as the violent legacies of ongoing civil war. Without addressing Myanmar’s turbulent past and its ongoing legacy, international efforts to protect environments and invest responsibly in Myanmar will be confronted with persistent issues of poor governance – and worse, continued violent conflict. 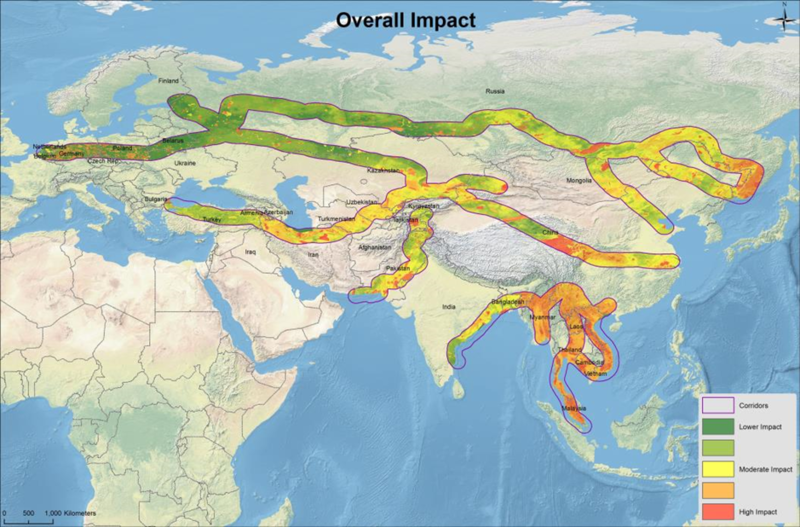 In order to successfully establish a green Belt and Road, Chinese actors must collaborate not only with government and business stakeholders, but more importantly with local communities and civil society to ensure that investment and development projects are responsibly and equitably carried out to realize inclusive, equitable and sustainable development – for the benefit of all involved.